So with my upcoming trip out to Anderson Ranch I realized I was going to be flying with a bunch of film. Normally I prefer to drive places so I can make photos along the way. The Journey being as important as The Destination. This go around I’m a bit time bankrupt and the distance is great enough to warrant a flight. This brings into play a whole set of variables.You see with a 2002 Crown Victoria I can fit an amazing amount of stuff. But right now I’m limited to a carry on in the overhead and one that will fit under the seat of the plane…. So some choices have to be made. First off I’m bringing the Canon 5dmk3 for ease of use and instant feedback during the workshop. 3 lenses 3 batteries 4 sets of cards and a flash round out that kit. I know a zoom takes up less room than 3 primes. It’s just that I don’t work that way. Primes just fit my way of working. My second choice is the tried and true Mamiya 7II with a 65mm and a 80mm. I chose this camera because it makes roughly the same aspect ratio as my 4x5.It has a leaf shutter for faster flash sync speeds and it has a much smaller profile.That and a few odds and ends round out my back pack bag..
Why the added expense and hassle of working with film? That’s a much longer post for a different time. So now that I’m mostly packed I need to worry about 2 other essential items. 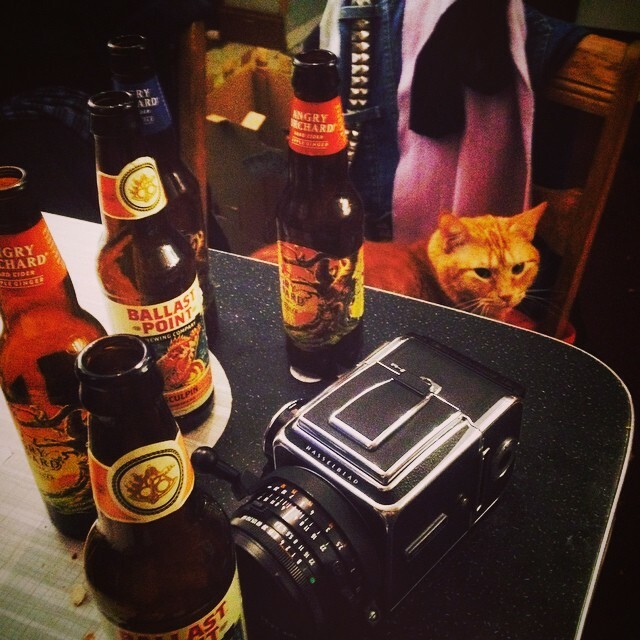 A tripod and some film. The tripod is the easy one, I’m going to use a smaller one with a ball head and stuff it in my suitcase.I won’t have as much room for underwear and socks but there is laundry available where I’m going so that should be fine.If I wanted one of the bigger ones for use with a bigger camera I could always ship it to my destination and ship it back when done but that’s just not practical right now. Now onto the 2nd and biggest essential. FILM. In particular Kodak Portra 400 120. Freezer bag with label and some emulsion choices. There are no direct flights from Boston to Aspen I’m going to be making a couple of hops. If worse comes to worst my film will get the Zap two times. Not the end of the world but not ideal and I’m not cool with that. I’m going through all the trouble to work with film I don't want it damaged. Fortune favors the prepared! Everything you need plus somethings you don't! but you'll need it if you don't bring it. That brings me to getting to the airport early. Being respectful of other people’s time and allowing yourself enough time to deal with being a special case is important. Worse case you just make your flight, best case you have extra time to buy an overpriced beer while waiting for that flight. Lastly mark your exposed rolls and keep them in a separate freezer bag. Still easily accessible along with the unexposed rolls just separate. I had to compromise with a screener once where they hand inspected my exposed film and xrayed the unexposed. Yup it came down to that. Exposed film is more sensitive so it was more important to me,the unexposed got marked and then used in the holga because that’s my happy accident camera, I’m already throwing the dice so why not a little more chance? So clear plastic bag, labeled and readily accessible. Smile, be polite and GET THERE EARLY. Make sense? I hope so,here is a handy link to the tech Support articles from Kodak. Introducing our newest Panopti-team member - Sloane Volpe! Sloane joined the team in March and has been fitting right in here at the office. Born & raised in Long Island, NY, she recently graduated from the Art Institute of Boston (Lesley University College of Art and Design) with a Bachelors of Fine Art in Photography. Sloane was a TA for a handful of professors, including Tommy Matthews, and took classes with Christopher James. She is self-taught in various alternative processes, but likes to focus on the gum bichromate process. She joined the Panopti-team to help with darkroom processes but has been quickly learning the range of all the departments here! Her go to cameras are her Hassleblad and Mamiya 7, both medium format film cameras. Shooting both color and black & white film, her subject matter ranges from "things left behind," to location focused shooting, to her autobiographical alternative process work. Check out her website HERE. She has sprained her ankles 6 times in her life so far. 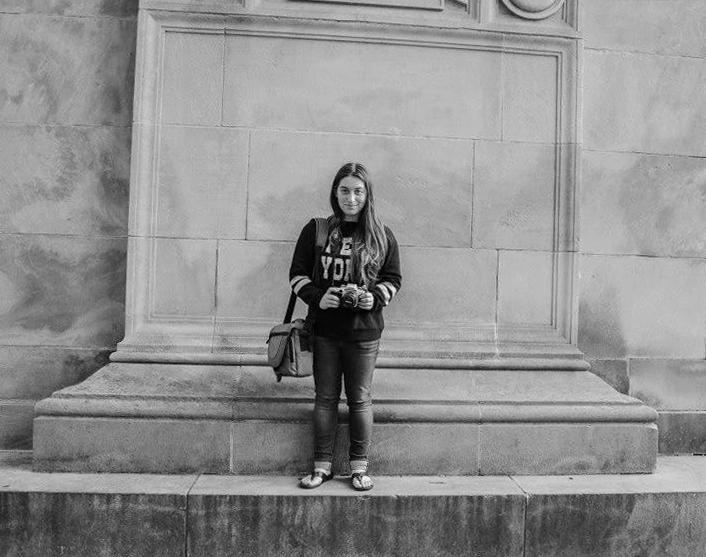 Throughout high school and her first year of college, Sloane was a street performer singing alongside a guitarist in Providence, Boston, and New York. Her go to songs were Adele "Rolling in Deep", The Animals " House of the Rising Sun", The Eagles "Hotel California". At our 10 year Anniversary, we announced the exciting news that we are taking over Panopticon Gallery from Jason Landry. Jason is no stranger to the Boston art scene and we were overwhelmed with the wonderful opportunity he presented to us to have the company come full circle and be under one ownership again. Since acquiring the gallery on May 1, 2017 we have been busy doing renovations and preparations of the space in Kenmore Square. We decided to give the space a little makeover and have started with a fresh coat of paint and spackling on the walls. We are sanding, staining, & putting a new coat of polyurethane on the desk. Next up is new light fixtures! We have exhibitions and events starting in the fall for the gallery and are looking forward to sharing them with you. We will be updating our social media pages and the website as we go so please follow us to see what we are up to! We are going to FILTER! 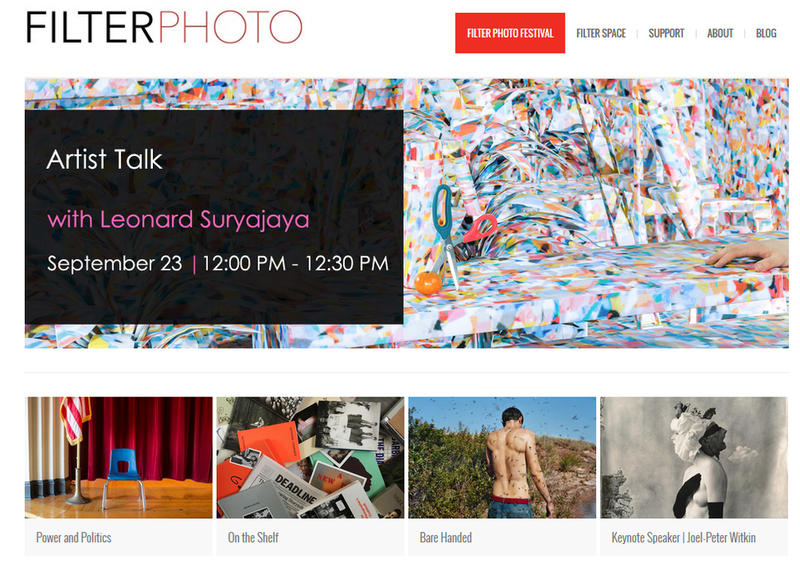 What is Filter Photo Festival? “Filter Photo is a not-for-profit 501(c)(3) organization based in Chicago, Illinois. Since 2009 Filter Photo has organized the annual Filter Photo Festival, a multi-day celebration of photography that includes workshops, lectures, exhibition receptions, artist talks, and other diverse programming. A primary component of the Festival is the portfolio reviews, through which photographers are able to connect with national and international curators, gallery directors, editors, and other elite professionals.”. How do I apply to Filter? You can register here. 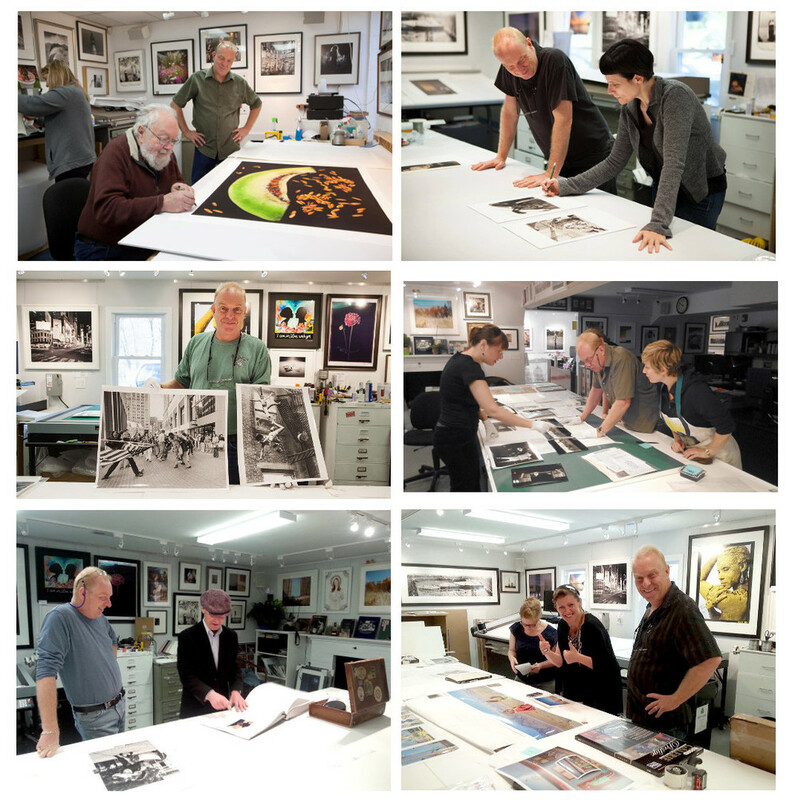 Sign up for 5 or 8 portfolio reviews and/or workshops. 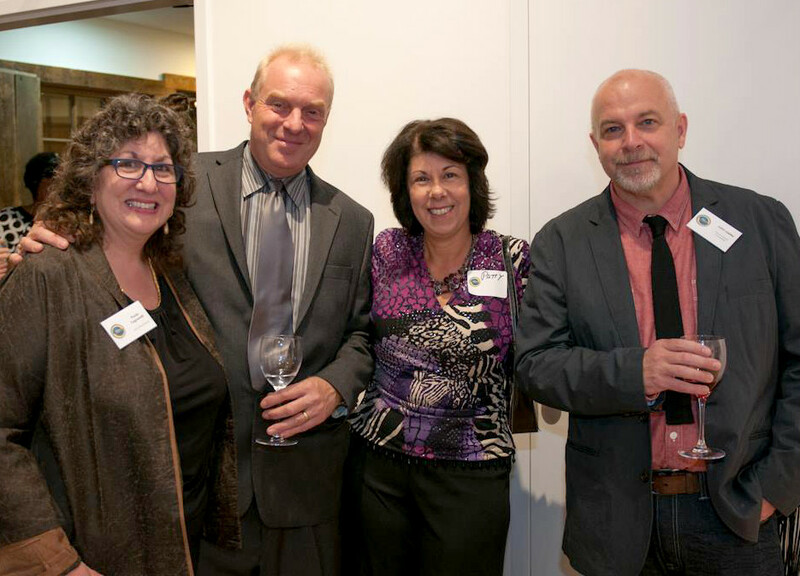 Reviewers included Paul Tagnorelli of the Griffin Museum of Photography and Kat Keirnan of Don’t Take Pictures. Workshops are presented by artists such as Keith Carter, Brandon Thibodeaux, Karen Irvine, April Wilkins, and S. Gayle Stevens. Also, artist talks by Alice Q. Hargrave, Patty Carroll,Leonard Suryajaya, Ross Sawyers, exhibition receptions, and much more. Some of the workshops have already sold out so make sure to get your spot! Joel-Peter Witkin is this years keynote speaker and he will be giving a lecture on Thursday September 22. What to expect from us at Filter? This is our first time at Filter and we are very excited! This means a lot to our small business and we can't wait to meet the artists, speakers and the Filter Team in person. You will get a chance to meet our talented staff members Elizabeth Ellenwood and Nick Schietromo. 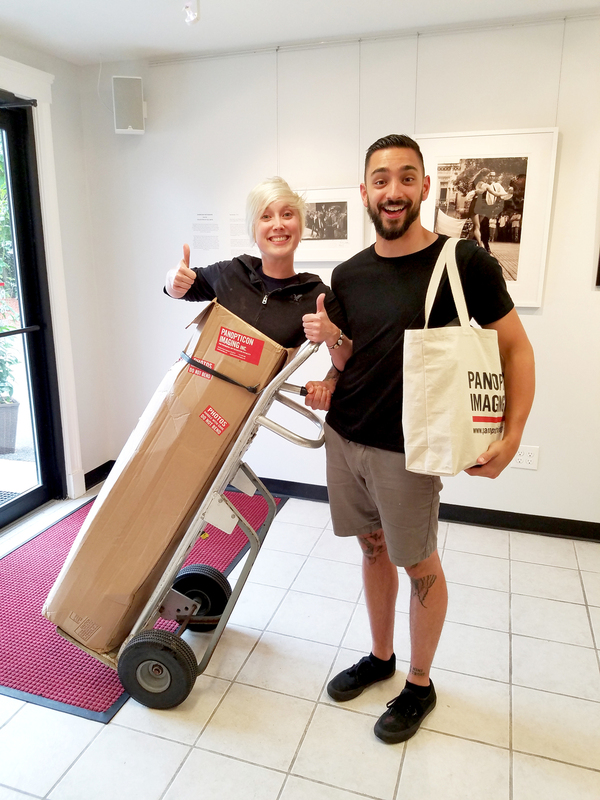 They are thrilled to visit Chicago and share Panopticon’s photographic printing practices and knowledge. We will be including details on how to prep for a portfolio review within the next few weeks so stay tuned! Elizabeth Ellenwood is our fun loving darkroom printer and resident animal lover. She received her Bachelors of Fine Arts in Photography from the New Hampshire Institute of Art in 2010. Following graduation she assisted Boston architectural photographer Peter Vanderwarker for a number of years. In 2012, she started working with us at Panopticon and became full time as of 2015. Darkroom printing and development is her passion here at Panopticon. Elizabeth known lovingly as Liz is obsessed with all things film. She is an accomplished alternative process printer having studied and assisted at Penland School of Crafts. Over the years she has learned the alternative processes of Wet Plate Collodian Printing, Tin Types, Cyanotypes, Albumen Printing and Emulsion Lifts. Also, she has taken classes with Carl Weese at the Center for Alternative Photography where she added Platinum Printing to her repertoire. Recently, she had a one person exhibition of her work at Danforth Art titled Elizabeth Ellenwood: Of Light and Line. Which received a wonderful review by Mark Feeney in the Boston Globe! Some fun facts about Liz. She loves cheese...I mean like really loves cheese. She is frequently known to throw a cheese party or two and loves to say "Queso for my Face-o". When not in the office you can find her chilling with her dog Ophelia and her drummer dude Josh who plays in the Boston-based band Girls, Guns and Glory. She loves to travel and has visited Germany, Ireland, Italy (2x) and Switzerland in the last two years. Her next excursion is to Hawaii next year! The newest member of the Panopticon crew, Bruce R. Wahl joined us just last year as a part time-er. He is currently finishing his Bachelor of Fine Art in Photography at Massachusetts College of Art and Design and is a freelance photographer working for clients throughout the Boston area. He brings years of photographic experience as well as some pretty sweet facial hair to the Panopticon team. You can usually find Bruce at the matting table or jumping into the Panoptivan for a delivery, where ever he is you can be sure there's a story he will have to share. When he is not at the office or at school, you can find him nerding out over old school motorcycles & film cameras, editing his own work, chillin with his cat Mr. Whiskey, and perhaps indulging in a glass of whiskey (yes there is a coincidence with the cat name) or a brew-ski. Needless to say Bruce fits right in here! You know that guy you know that can fix everything and make it seem effortless? Put a Graphic T on him and that's Chris! A photography graduate of the Center for Digital Arts and a Mathematics degree from the University of Massachusetts Lowell, Chris has been a part of the Panopticon team since 2011. His expertise & skill set stretch from the darkroom & film processor, to the digital world, to the framing table and hits everything in between. Chris started his photography career at Ritz Camera then continued on to EP Levine and assisting as a second shooter for weddings. As a full timer here, his days are filled with a little bit of everything: meeting with clients, digital printing, scanning, custom framing, and maintenance of all the machines. Needless to say we like to keep him busy! - Chris's favorite M&Ms are crispy so if you need to bribe him bring a few packages of those. - He is an avid Foo Fighter fan. - He is a happy new owner of a 2014 Triumph Bonneville Motorcycle so you can catch him cruising around town. A south shore native, Shannon McDonald joined our team in 2013 as the office manager. Whether you call the office or swing by for a visit, she is there with her positive energy and willingness to help with whatever project you have. With a Bachelors of Fine Arts degree in Photography & Electronic Imaging from the University of Massachusetts at Dartmouth, Shannon's skills go way beyond an office manager. She has to perfect amount of organization and creativity to add to Panopticon Imaging. Shannon take packaging very seriously! When she is not at the office Shannon can be found working on her own artwork at her studio in the E. T. Wright Buidling Artist Studios. Her mixed media pieces have been exhibited in galleries such as the Zeitgeist Gallery, Trescott Street Gallery, Panopticon Gallery, and the Nave Gallery. Shannon is a gallery artist for the South Shore Art Center as well as a curated member of the Southern New England Artist Community. Need your work shipped? Shannon's got your back! She has now expanded her artwork to a home decor line that captures her bright personality and love of design. Make sure to check out her Etsy site, it feels good to support local artists! We are so excited to share this news. WE NOW HAVE A DELIVERY VAN!!! Check it out! 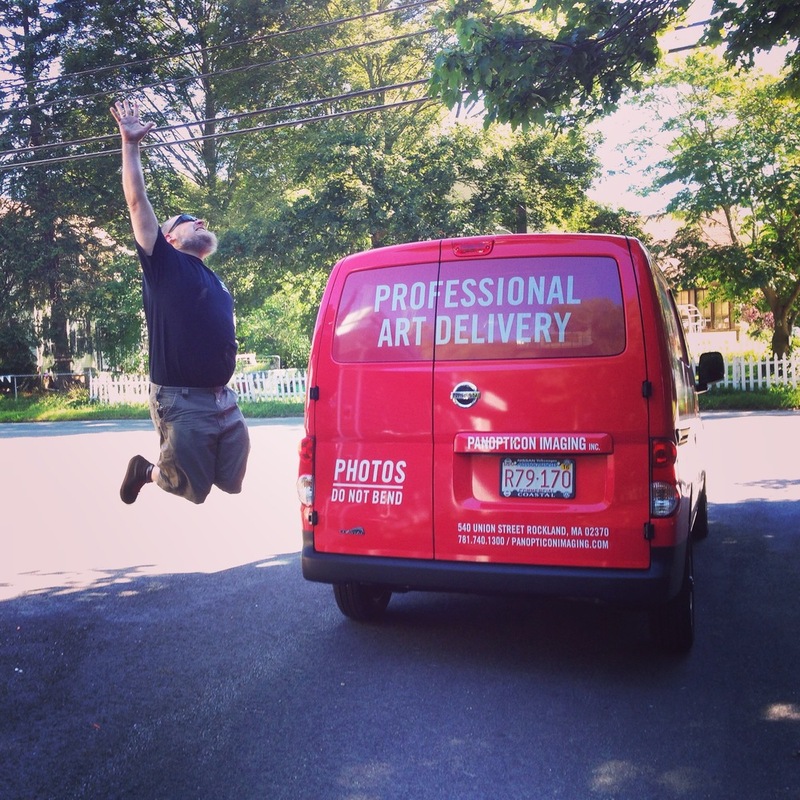 We have a delivery van that can accommodate images up to 56×70 inches in width! We can make deliveries on request to Connecticut, Maine, Massachusetts, New Hampshire, New York, Rhode Island and Vermont. We are so proud of our PanoptiVAN! Nick Schietromo is our framer and has been with Panopticon for about 2 years! When you visit the office he can be seen working behind our professional matting and framing table. He is very meticulous, thorough framer and a talented photographer too! One of things that sets us apart from other companies is that almost all of the staff here are working artists. Nick's work has been exhibited in such galleries as the Nave Gallery, New York Center for Photographic Arts, The Photographic Resource Center , Gallery at Panopticon Imaging and the Vermont Center for Photography. Not to mention he was an Honorable Selection for the 2015 Magenta Foundation - Flash Forward. Also, we share Nick with Gallery Kayafas where he is the Assistant to the Director. Any questions concerning printing and framing presentation are welcomed and returned with valuable insight from Nick. Some facts about Nick. He loves cult classics, collecting vintage images at the Brimfield Antique Show, snacks, tattoos and vinyl records. Paul Sneyd has been a Master Printer for over 35 years. His darkroom career began in 1977, when he joined Jet Commercial Photography. During the next 10 years, Paul was the sole printer for Jet's five commercial staff photographers. In 1987, Paul became the master printer for Panopticon Gallery of Photography, one of the oldest photographic galleries in the United States. He would spend the next 20 years printing for Panopticon's many reputable artists and exhibitions before becoming the owner of Panopticon Inc. in 2007. Throughout the last 35 years, Paul has printed for and worked with many local and national photographers including : Harold Feinstein, Isa Leshko, Stanley Forman, Agnieszka Sosnowska, Paul Ickovic, Asia Kepka, Bradford Washburn & Ernest Withers, among many others. He has produced images for and has working relationships with a large sum of New England galleries, including the Boston Public Library, Focus Gallery, Griffin Museum of Photography, Harvard Law School, Museum of Fine Arts, North River Arts Center, New Bedford Whaling Museum, Panopticon Gallery, and the South Shore Arts Center. Paul has been happily married to his lovely wife Patty for 24 years. They have two wonderful daughters and many dogs. He is an avid fisherman, red wine drinker and all around great guy! Why Rockland? We reached maximum capacity at our location in Hingham and desperately needed to expand. Rockland had the perfect building for us at the perfect price. We renovated an older building so we could make room for all of our darkrooms & printing rooms and expand our services. Renovations took about 8 months but it was worth it! We moved from Hingham to Rockland in the spring of 2013 and couldn't be happier. It is just 22 miles south of Boston! You can get to us via Route 3. We have full directions on our website. We also offer weekly deliveries into Boston. Don't worry if you can't make it to us. If we can't deliver it to you, you can upload files directly thru our website and we can ship everything back to you! What kind of town is Rockland? Rockland is a small town just south of Boston and was recently (2013) listed as one of the top ten places to live by the Boston Globe. Rockland also has two old factory buildings that have been converted into Artist space. One is the E.T. Wright Building a former shoe factory and the second The Sandpaper Factory. 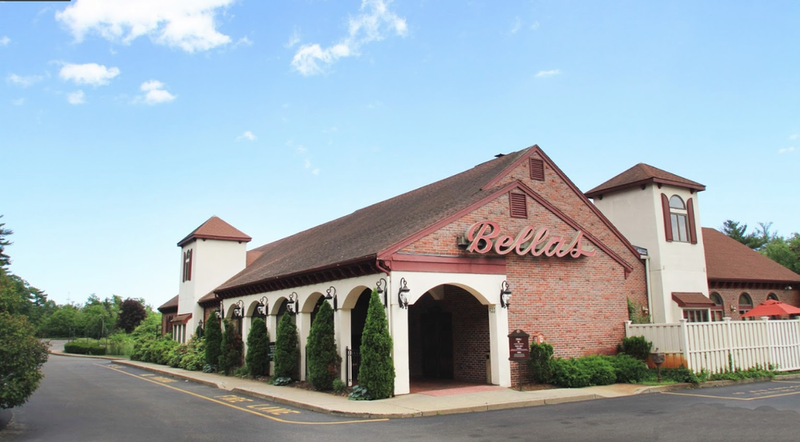 Not to mention it is home to Paul's favorite place to eat Bella's Italian Restaurant. He recommends #35 on the wine list, it is a nice Chianti. Rockland Rocks!